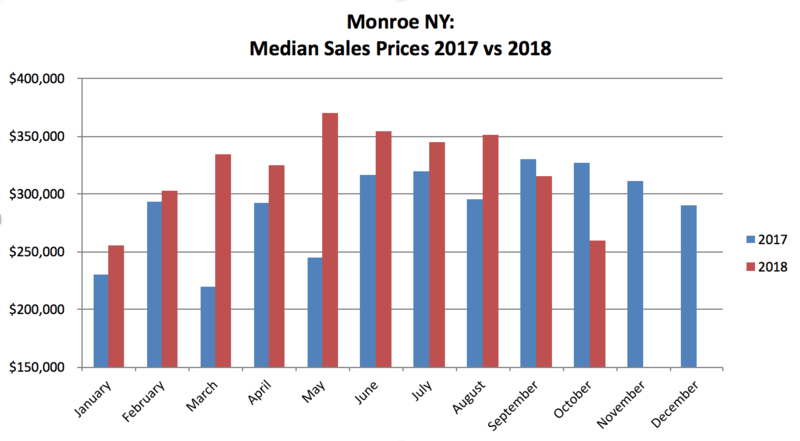 The Monroe, NY real estate results are available for October 2018. The number of monthly sales stayed strong, available inventory decreased from last month and sales prices were lower. Monroe is currently experiencing a balanced market, and it remains a good time to buy or sell. Following is an overview of the October 2018 Monroe NY results. In the month of October 2018, there were 27 sales which 2 less than the previous month and 1 more than the same time last year. That is a healthy sales level for the area. In terms of inventory, November started with 128 homes on the market, a decrease of 9% over the previous month. The current inventory levels are significantly higher than the same time last year by 34%. So while inventory is currently dropping, the market remains balanced and it is not the seller’s market of last year. The median price for October 2018 was $260K, which is significantly lower than last month (a 17% drop) and last year (20% drop). Watching the market over the next few months will shed some light as to whether this is a trend or a blip. What I can say is that 30% of the sales in the month of October were distressed sales. Most of the distressed sales were low-priced foreclosures so perhaps that was part of the lower results. At the time of this writing on November 13th, the median so far in November is $292K, but there have been very few sales so far so this may not be useful information. The homes that sold in January took more than four and a half months to get to signed contract. In October, the time to get to contract for the homes that sold was around three months. While better than the beginning of the year, the time to contract has been increasing over the last few months. Perhaps the harder to sell homes which have languished on the market are now being sold. This seems to be the normal trend as inventory decreases. The real estate market in the town of Monroe NY has moved into a more balanced market. Prices in the last month dropped, probably due to the high percentage of foreclosed properties that sold in October. Overall inventory levels are decreasing slightly. This is still a great time to sell or buy. If you are a seller and want to put your home on the market, let’s do it. If you are a buyer, it’s important to be ready to go. The best way to ensure you’re ready to sell or buy is to talk to a real estate professional. I’m happy to help if you are in Monroe or Orange County! To get started, call me on 914-419-0270 or email me at kat@thehousekat.com. For previous market results reports, click here.